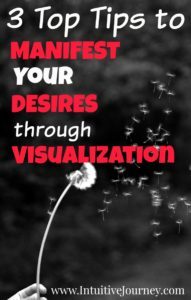 Visualization of a desire is an effective way to bring positive energy to your body. Meditation, along with visualization, is a good way to get started on manifesting your desires. Here are some tips for improving your level of consciousness and self-awareness to open your body, mind and soul for visualization. 1 – Know what your true desire is. Too often, a material object can cloud our judgement of what our soul is really searching for. You may dream of a bigger house, thinking that it will solve all the problems of an unstable family life. Rarely are material items the basis of a real desire. 2 – Balance your chakras. You may want to focus on the heart chakra as this is where the true answers may lie in finding your true desire. Because it is the center of life and love, your true desire will emerge. 3 – Create a visual image of your desire in your mind and carry it with you. This image may come in different forms. For instance, requesting a healthier body may take the form of running along a sandy beach, feeling refreshed from the smells of the sea air. Wishing that you were less depressed may materialize in your mind of an adventure to an unknown place where the sights and sounds are soothing and refreshing. Visualizing a desire requires knowing what you want and why. Not liking who you are or not knowing where you want to be will stop visualization of any type. You must possess a desire for an intended thought or a realistic goal. Looking inside can often deliver answers to what your desires are. Only then can you begin the steps of visualizing and believing in your wants. After this, manifestation will come much easier.